In objecting to President Donald Trump's executive order banning immigrants and travelers from six Muslim-majority countries, civil rights lawyers pointed to messages the president posted on his Twitter account as evidence he based the ban on religion, not national security. Now, as news outlets report he's deleted 22 tweets -- including one noting a meeting with military brass at his Mar-a-Lago resort in Palm Beach, Florida -- two good-government watchdog groups have sued Trump, claiming he's violated federal and constitutional law that prohibits destruction of presidential records. Citizens for Responsibility and Ethics in Washington and the National Security Archives filed the lawsuit late last week in federal court. The groups also claim White House personnel "have used and ... continue to use certain email messaging applications that destroy the contents of messages as soon as they are read, without regard to whether the messages are presidential records," according to the suit. "The American people not only deserve to know how their government is making important decisions, it's the law," Noah Bookbinder, CREW's executive director, said in a statement when the lawsuit was filed. "By deleting these records, the White House is destroying essential historical records." Under the federal Presidential Records Act, the president and his staff are required to maintain records of official business or communication for eventual public access, according to CREW. Gizmodo reports that Trump has deleted 22 tweets from his account since taking office in January. That includes messages promoting his appearance on Fox News' "Fox and Friends" as well as the infamous "Covfefe" tweet. The lawsuit is the latest turn in the ongoing controversy regarding the president's profligate use of Twitter, and whether the messages are official or unofficial statements by the nation's chief executive. Trump has long been known for itchy Twitter fingers; even his allies say the president has an compulsion with using the medium to lavish praise on his supporters, torching his adversaries and transmitting his unfiltered worldview to 31 million followers, 140 characters at a time. 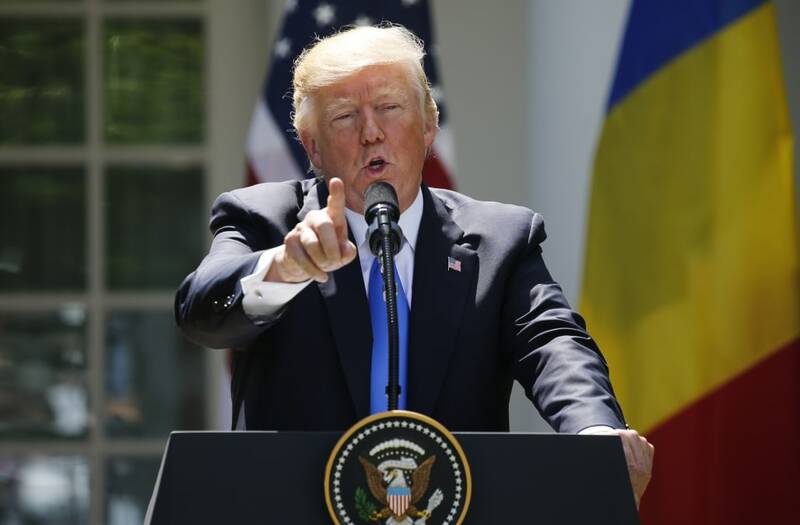 Trump has defended his use of Twitter, saying it allows him to speak directly to the American public, bypassing traditional media outlets who he has wrangled with. When challenged on whether the tweets are official policy, however, the White House has been inconsistent, largely depending on the contents of the president's messages. Press secretary Sean Spicer has declared Trump's tweets are "official statements by the President of the United States," -- a declaration that led opponents of the president's travel ban to use them as evidence he used the order to intentionally discriminate against Muslims. In the lawsuit, CREW and NSA take the matter a step further. They insist that "presidential statements made on Twitter sent from the President's personal Twitter account, which are subject to federal record-keeping obligations, have been destroyed," according to the suit. The investigative journalism organization ProPublica has unearthed the deleted messages and posted them on its website. Meanwhile, the CREW and NSA suit alleges presidential staffers use secret chat apps, such as Confide and Signal, and other encrypted communications programs -- including some that destroy the message as soon as it is received or sent. CREW argues that use of those apps also violate federal presidential records laws. Deletion of Trump's tweets, and his staff's use of encrypted communications, the suit alleges, "prevent the proper preservation of records the Defendants generate or receive when carrying out the President's constitutional, statutory, or other official duties." The White House has rejected the allegations: "The White House doesn't permit the use of apps such as this and works diligently to ensure all staff comply with The Presidential Records Act," a representative told Newsweek.